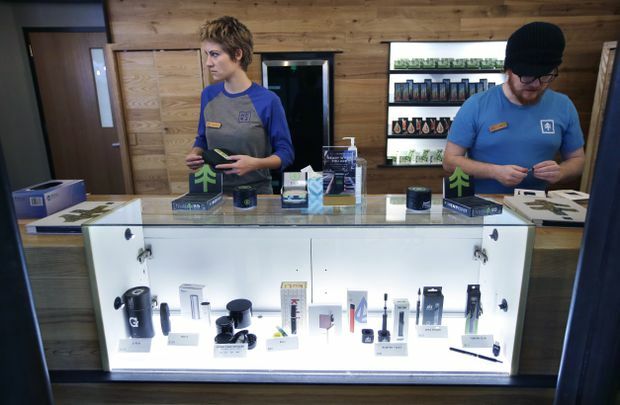 Patient service associates stand at a counter that features a display of vape dispensers that could be used for legal recreational cannabis at New England Treatment Access medical marijuana dispensary in Northampton, Mass., on Oct. 17, 2018. An existing medical marijuana dispensary in Northampton – nestled in Massachusetts’ scenic Pioneer Valley – plans to open its doors within days to anyone 21 or older looking for products ranging from pre-rolled joints to cannabis-infused edibles, creams, lotions and cooking oils. A second store in the small town of Leicester could also open at or around the same time, while dozens of other retail applicants await final licensing approval from state regulators. Not Northampton, which appeared to roll out the welcome mat. While about 54 per cent of all Massachusetts voters supported the 2016 referendum, 73 per cent in Northampton gave their blessing, one of the widest margins anywhere in the state. “It’s already counterculture. It’s like their customers are already here,” said Steve Morin, a 68-year-old retired delivery truck driver and Air Force veteran who lives in Springfield, Massachusetts. He visits Northampton frequently and described himself as an occasional marijuana user who may shop in the store when it opens. The city’s bustling downtown sports trendy restaurants and coffee shops, bookstores, galleries and a performing arts centre. Northampton is home to Smith College, an elite liberal arts school for women and one of several colleges and universities – including the 30,000-student University of Massachusetts flagship campus – within a 10-mile radius of the city. Most undergrads, however, aren’t old enough to buy marijuana legally. Anticipating long lines forming when the store first opens, NETA has worked closely with police and city officials on traffic and parking issues, and retained former Boston Police Commissioner Ed Davis – who became a national figure in the aftermath of the 2013 Boston Marathon bombings – as a security consultant, Albaraez said. Washington state launched legal marijuana sales in mid-2014, shortly after Colorado, following a lengthy scramble to license growers, processors and stores, all of whom had to contest a gauntlet of regulations ranging from what pesticides they could use to local zoning rules. Only four stores opened on the first day of sales, with customers waiting in long lines to pay exorbitant prices for marijuana also in short supply. Medical marijuana users are also exempt from paying the combined 20 per cent state and local tax on pot.